The concerns about sugar and kids go far beyond the risk of cavities. An extensive research review by the American Heart Association (AHA) found that kids who consume a lot of foods and drinks with added sugar could develop heart disease risk factors — like obesity and high cholesterol — starting in childhood. These risks can occur with sugar intake far lower than a typical child’s. In response to this threat, AHA issued strong recommendations to safeguard kids’ health. First, children under 2 years old shouldn’t be given any added sugars. That means no packaged food of any kind that lists any type of sugar among the ingredients. The natural sugars in whole foods like fruit, for instance, are fine. Next, kids between ages 2 and 18 should take in less than 25 grams of added sugar daily. Compare these numbers to the 80 grams of sugar most kids eat every day. That’s more than triple the suggested limit. What can you do to cut back? 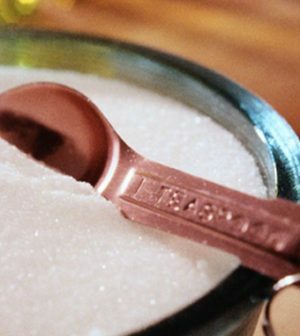 Nutrition labels list sugar in grams, so it’s easy to keep track of daily intake. Because sweetened beverages pose a particular threat, kids and teens should be limited to just one 8-ounce serving per week.